Sunday morning started with a text from a friend who said they were tailgating in the general lot, and asked if Victoria and I would like to join. It was already 9:50 by this time, and I wished they would’ve given us a little bit more notice. We were going to try and stop by for a little bit, but once we hit traffic after 894, we took an exit and hit up Jimmy John’s instead. I got my usual Big John, which consists of delicious roast beef. We took Bluemound to the preferred lot instead of jumping back on I-94, and it went rather smoothly. 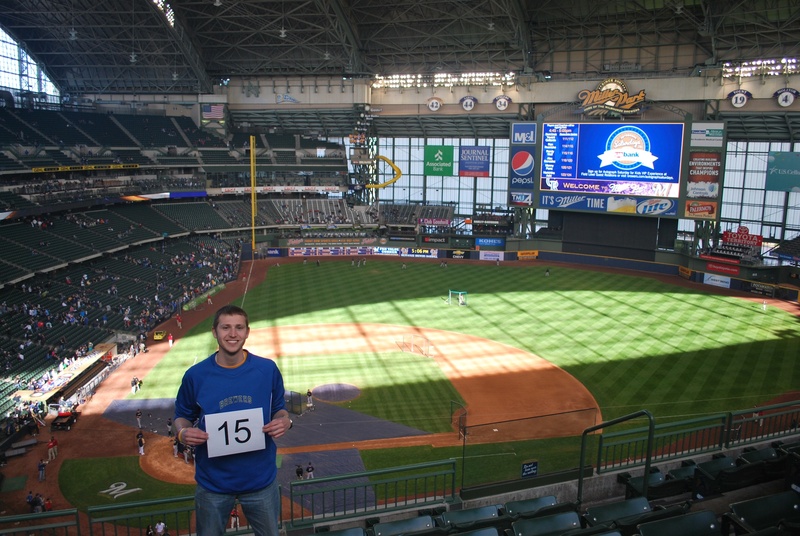 We got to Miller Park at 11:45, and went right to the upper deck. I’ll be glad when I’m done getting the picture taken up there. My knee really hasn’t gotten any better, so coming back down the stairs is the reason for the angst. It’ll be more crowded on the other levels though, so it’s really a gift and a curse. I think tomorrow’s will be from behind home plate, I was hoping the roof might be open for it, but it doesn’t look like that’s going to happen. We got to our seats and ate lunch, and waited for the game to start. I still snicker a little when they water the infield, because they need five guys to use a hose. I know they don’t want to mess up the infield, so it makes sense, but it still seems a little strange. 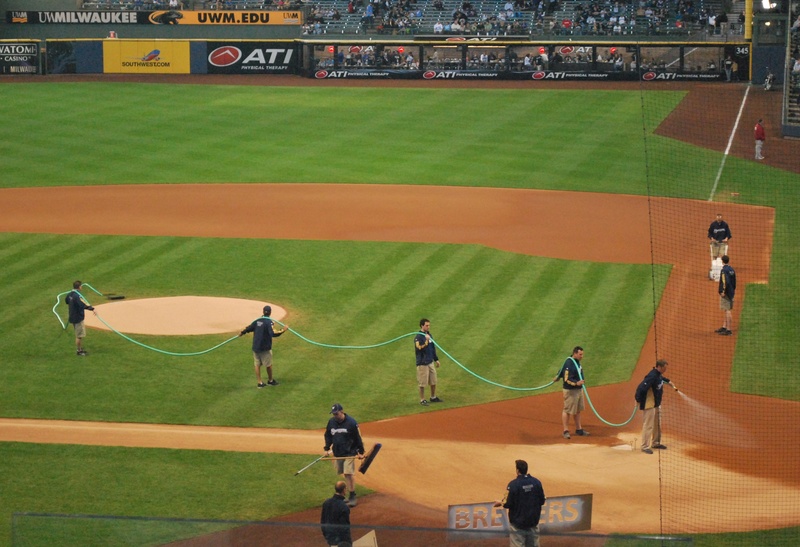 For those not too familiar with the upkeep and care for a baseball diamond, they water the “dirt” to keep it soft and not as dusty. I put dirt in quotes because it’s not really dirt, it’s a combination of sand, silt, and clay. Watering the infield wasn’t done very often, if at all, at the little league diamonds of my youth. As a result, sliding into a base could be a very painful experience. The ground underneath the top layer of sand dries out if it doesn’t rain very often, and it becomes pseudo-cement rather quickly. I just thought it looked silly, I know it’s the Rockies and there are “Cowboys” in Colorado, but nonetheless, it gave me a chuckle. “This is baseball, it ain’t no rodeo” is something that I could see some fans taunting him with. But if that’s his personality, then more power to him. If Rockies fans didn’t like it, I’m pretty sure he wouldn’t be wearing it during the pregame show. 1) A poster/sign someone made and brought to a game last year. 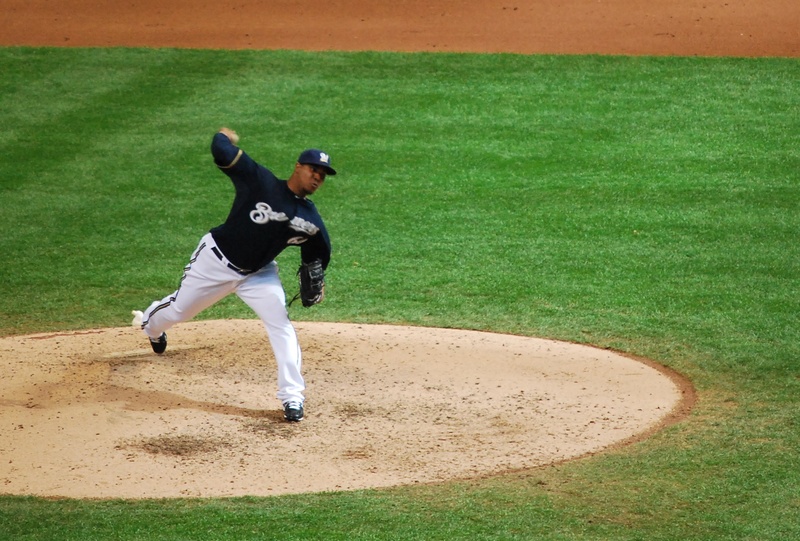 The Brewers played a short video montage which highlighted some moments from his MVP season. 2) Braun tipping his cap to the crowd, after coming out of the dugout. 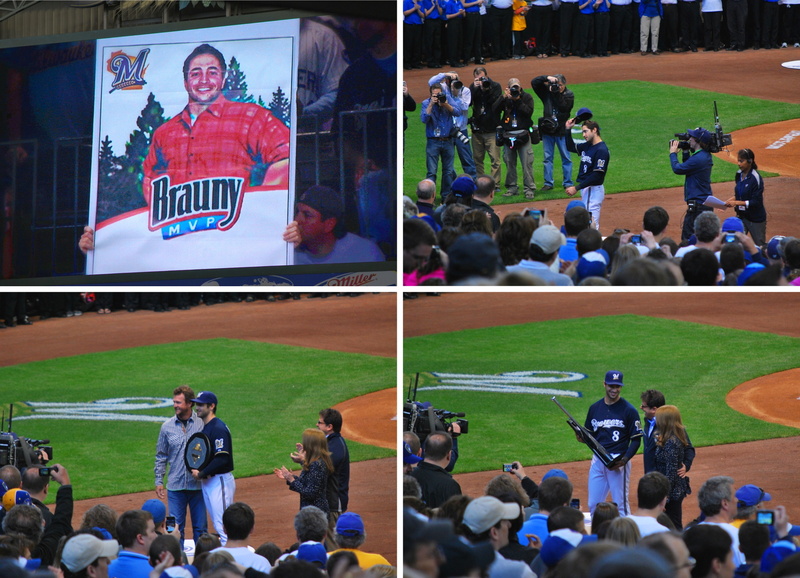 3) Braun, with Mark and Debbie Attanasio. Mark is the Chairman Principal owner of the Milwaukee Brewers, and he presented Braun with his fourth consecutive Silver Slugger award. 4) Robin Yount and Ryan Braun posing with the MVP plaque, Robin won AL MVP as a Brewer in 1982 and 1989. Robin presented Braun with the MVP award. It was a pretty special moment. 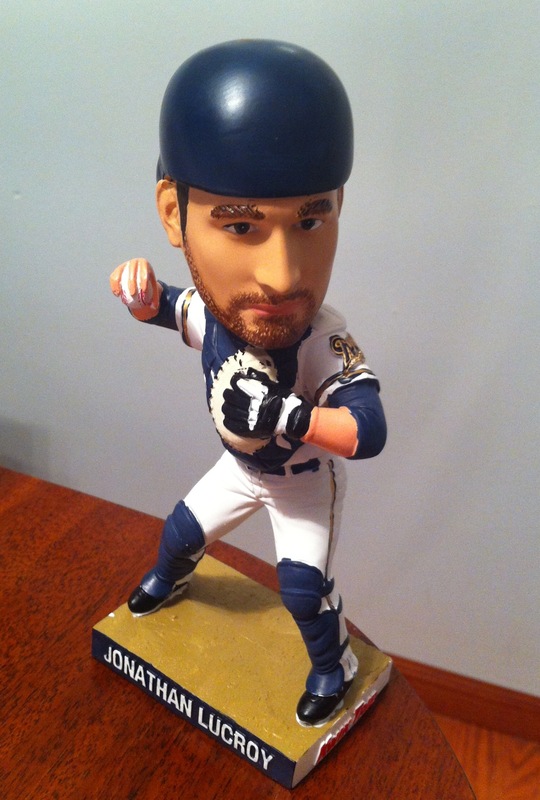 It was also a special day for Jonathan Lucroy, because it was his bobble head day! I don’t think you can call yourself a Brewer until your likeness is formed into a small ceramic sculpture with a head that is too big for the body. I am being honest, who doesn’t love a good bobble head? This one appears to be of higher quality than in past years, and the face looks just like Lucroy, something that can’t be said about a lot of bobbles. I think they may have started paying the workers more, because the paint job appeared better than previous bobble heads. I took out my Zack Greinke bobble from last year, and Lucroy’s did seem a little better. The duration of head bobble favored Greinke though, and it wasn’t even close. I don’t know if they started using more rigid springs this year, but I timed how long it took for the bobbling to come to a complete stop, after giving each head an equal twist. Final score: Greinke 50 seconds, Lucroy 5 seconds. I was blown away. It could just be that Greinke likes shaking off signs, and Lucroy doesn’t like saying no. The game itself was close, and was tied at one a piece heading into the 8th. The Brewers would have the top of the order leading off the bottom half, so I was hoping for a quick half inning from K-Rod, and then see what happens. As is often the case with K-Rod, he made the eighth somewhat difficult to watch. He gave up an infield single, walked Giambi on 5 pitches, and then gave up a two run double to Cuddyer, and that was that. The Brewers got their first two batters on base in the bottom half, but then Braun popped out to first (below), Aramis Ramirez flew out, and Corey Hart struck out looking, ugh. Willy Peralta, who was just called up, made his major league debut in the top of the ninth, and I captured his first pitch as a big leaguer. He is pinned as a potential future ace, and I’m hoping he can live up to the hype. If so, I can see him anchoring the Brewers staff for years to come. He gave up back to back singles but then struck out the third batter of the inning. Lucroy had thrown him the ball back, but the Brewers dugout was calling for it. A major league pitcher’s first strikeout ball is something that is typically kept as a momento. Peralta tossed it towards the dugout, and after a few bounces it started rolling. One of the Brewers’ bat boys didn’t know what was going on, and he quickly got up and tried to make a save with his foot. I’m almost positive that he thought it was just a scuffed ball that he would usually have given to a kid. Luckily it bounced off his foot and into the dugout. I thought it was pretty funny, but I don’t think anyone around me saw what had happened. 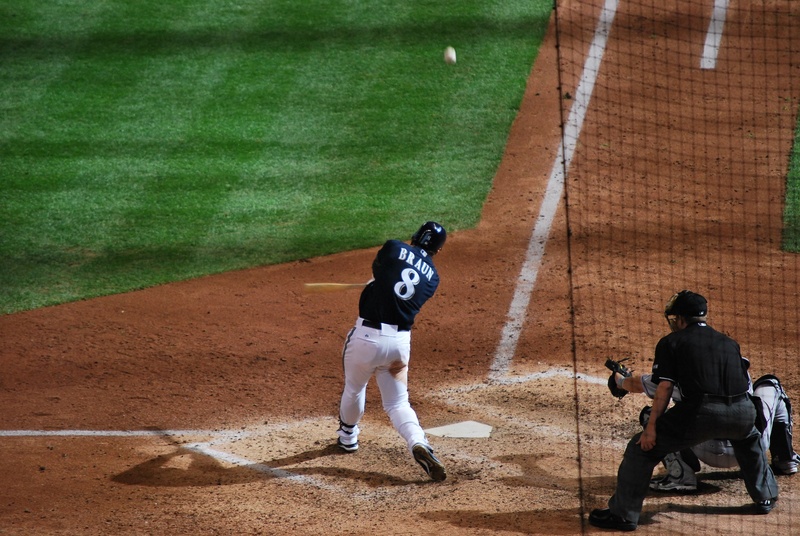 The Brewers went down quietly in the ninth, even though Gamel hit a another ball hard, that resulted in an out. He’s hitting a “hard” .278 in my book. He has to be leading the team in hard hit balls that haven’t fallen for base hits. The law of averages will eventually play out, and I see his batting average going up in the near future. I missed a pitch at the game, and I’m not too happy about it. 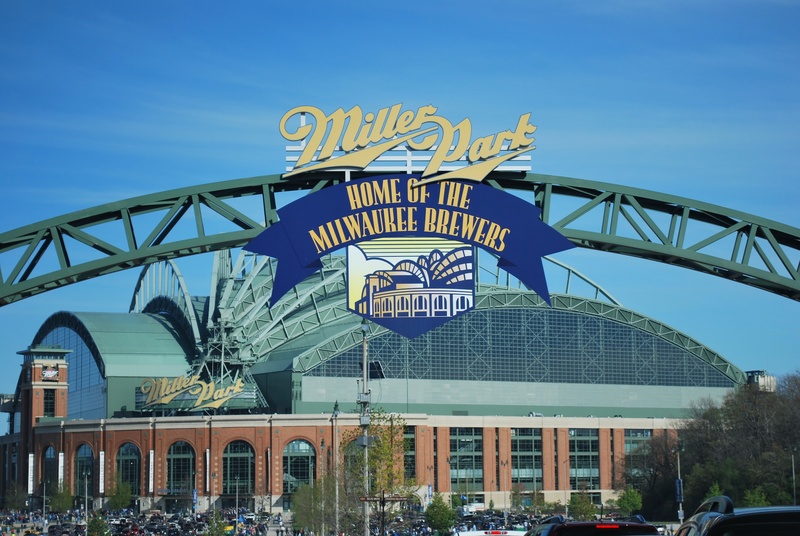 The “Ice Man” is a beer vendor at Miller Park, and he’s the man. He’s really friendly, and uses some very famous lines. “Who needs a shiver?” and “Be careful, you might get frostbite!” are the two most noteworthy. After someone buys a beer he’ll also yell “YOOOOOO! OOOO” followed by “AAAHHH”. Whenever I see him I give him a YOOOOOOOOO! and we exchange OOOOOOs and AAAAHHHHs. I saw him in the third inning on the opposite aisle of my section, and shouted “YOOO!” He had just started talking with someone else, and didn’t hear it. Victoria was a little embarrassed because a bunch of people looked at me like I was crazy for yelling that, especially since the Ice Man didn’t reciprocate. I became distracted and was waiting for him to turn around, to redeem myself, and missed the 1-0 pitch to Nyjer in the bottom of the third. I’m better than that, I promise. 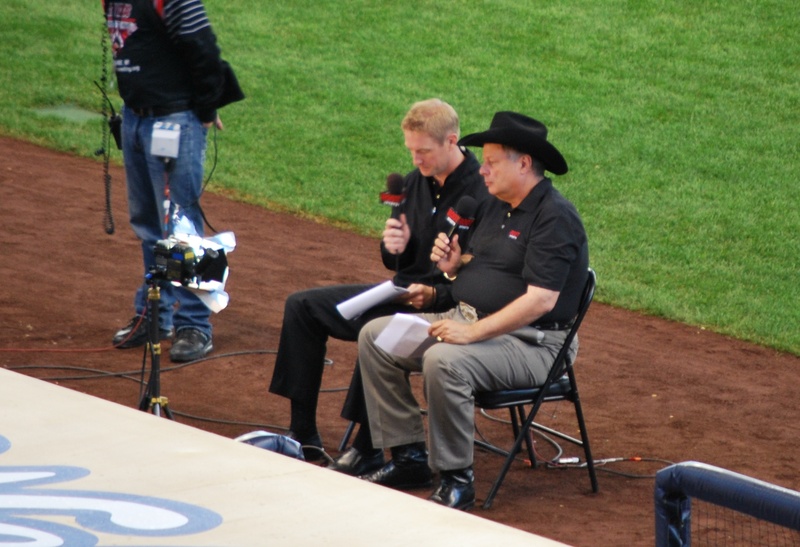 I’m going to the game tomorrow with Larry Granillo, who writes the Wezen Ball and Tater Trot Tracker blogs for Baseball Prospectus. Hopefully the Crew can get some hitting and pitching on the same night, because it seems like we get one or the other, but not both. Saturday was an all around great day. Victoria met me at my parents’ place in Fort around noon, and we left for my Grandpa’s around 12:45. 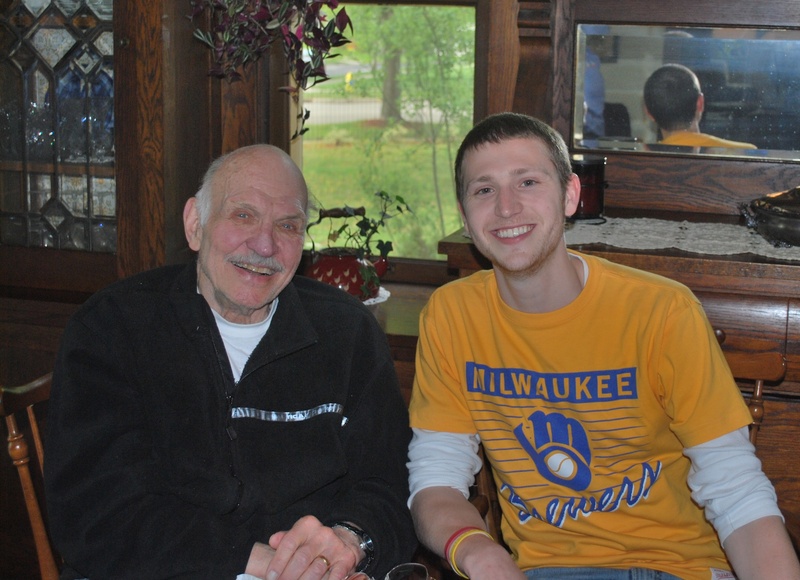 His name is Wallace (we call him Wally), he’s 85, and lives in Delavan, Wisconsin, with his second wife (of over 35 years). He’s a great guy and I feel like he’s my link to the Rouse side of the family. My dad passed away when I was nine, so my Grandpa has been the one to tell me about the Rouse family and its history. I’m not sure how long this was hanging in their entryway, but recently I’ve noticed it and have asked about it each time, because I forget where the pictured Rouse lies on our family tree. 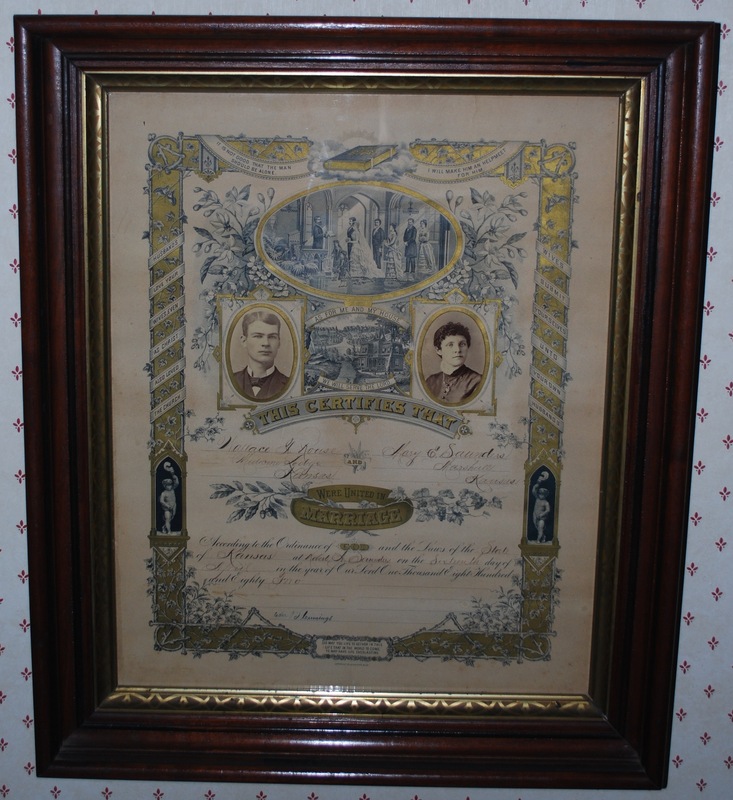 This first picture is the Marriage Certificate of my Great Great Grandfather, Wallace Thurman Rouse, who my Grandpa was named after. I think it’s cool partly because it’s so old, and because it’s an ancestor of mine. It’s dated April 16th, 1882, so it’s just over 130 years old! Also, some of the sayings that are on it might be viewed as a little strange by today’s standards. The one in the top left reads “It is not good that the man should be alone.” And then the one going down the right side reads “Wives submit yourselves unto your own husbands.” I don’t think this sort of stuff appears on today’s marriage certificate. I do like old documents and pictures, as I think it provides a window into the past. 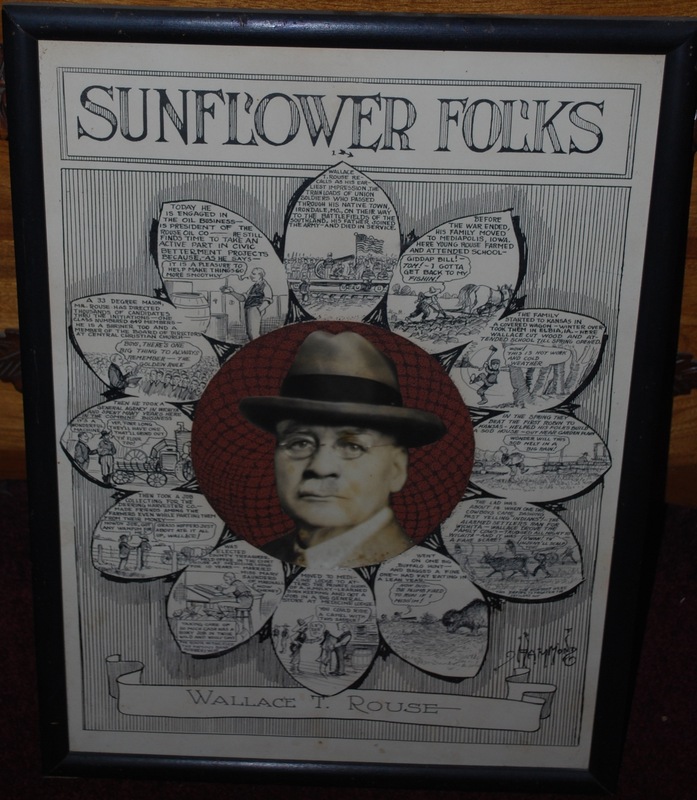 My Grandma brought out this piece as well, she said it had been printed in newspaper back in the day, without that color picture in the middle of course. It’s somewhat of his life story. Clicking on it will enlarge the image, but it still might be hard to read. One of the pedals says that he witnessed a famous bank robbery at one point. Kansas in the late 1800s was a place for outlaws apparently. Victoria and I ate lunch with Wally, Rosalie, and my Uncle Scott. After lunch the guys played cribbage (I went 1-1), while Victoria and Rosalie talked and ran an errand. I got a picture with Wally before we headed out. Wally’s mother lived to be 98, so I’m hoping that Grandpa can try to match, if not best, that longevity. Victoria and I made the hour drive from Delavan to Milwaukee, and as we were pulling into the preferred parking lot I noticed a great photo opportunity. I like it because it’s a welcome sign, with the glorious destination waiting in the background. New to the main entrance staircases this year are some pretty cool advertisements for Southwest. I noticed them on opening day, but never bothered to take a picture. As you can see, each riser has a segment of a picture of Miller Park, then above it an airplane and some text for Southwest. Also new this year is the starting lineup, that the Brewers adjust for each day’s game. This is also sponsored by Southwest. 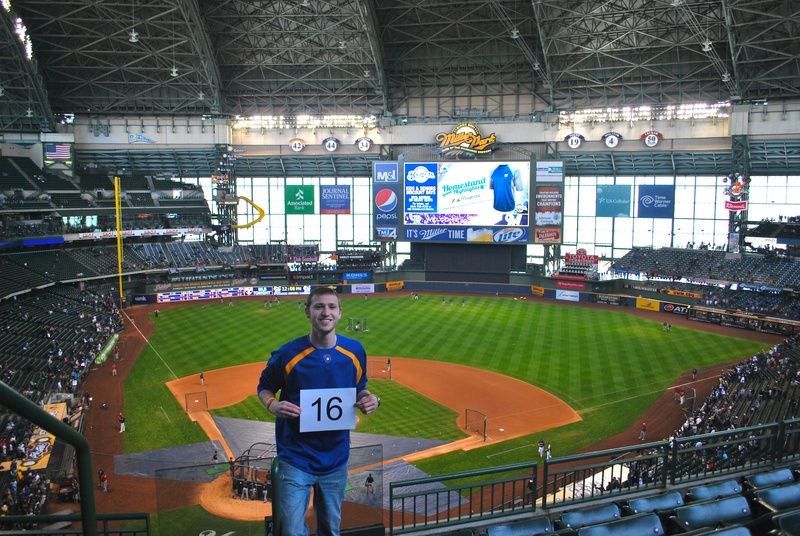 Victoria and I went to the upper deck to get game photo number 15. When we got up there it took a few minutes for me to figure out from which section I had gotten the picture taken the day before, and then move over a few sections. After getting the picture we went to get some food. I went with the BBQ Brisket Grilled Cheese. It’s $6.75 and I was a little disappointed with the amount of Brisket. Don’t get me wrong, it was delicious, but there were five or six bites that contained nothing but bread and cheese. We got to our seats with plenty of time to spare, and I was ready for the game. Marco Estrada got the start, because Narveson injured his shoulder and could be done for the year. Estrada, despite only pitching 5 innings, deserved the win. He gave up two hits, one run, and struck out NINE, while walking none. He actually was in line for the win after the Brewers scored two runs in the bottom of the fifth, but Manny Para gave up two in the sixth, and Estrada got a no decision. The Brewers tied it up in the sixth, and then put a six spot on the board in the seventh to open up a lead they wouldn’t relinquish. The Rockies cut it to five with a run in the ninth, but that was it. Final score: Brewers 9 Rockies 4. 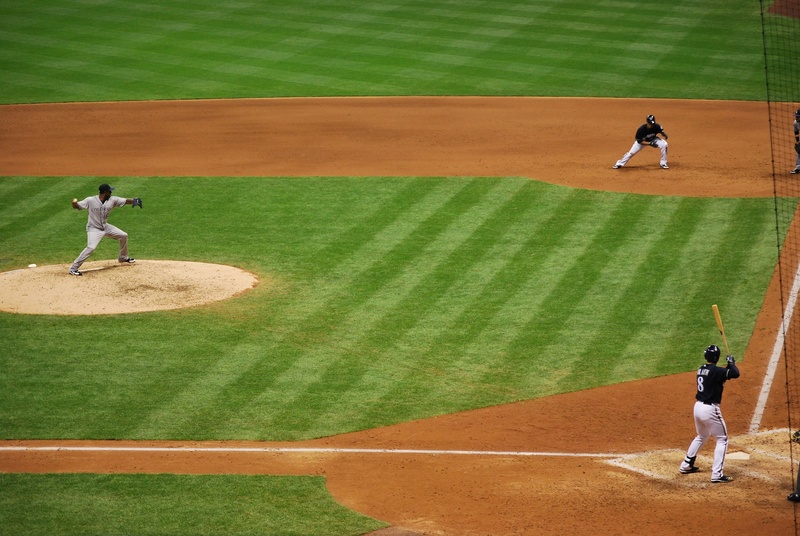 FIFTEEN pickoff attempts at first base, I’m not one of the people that boo when the opposing pitchers does it, because it’s part of the game, but it does get old. The Brewers did it a bunch too, so it wasn’t all one sided. 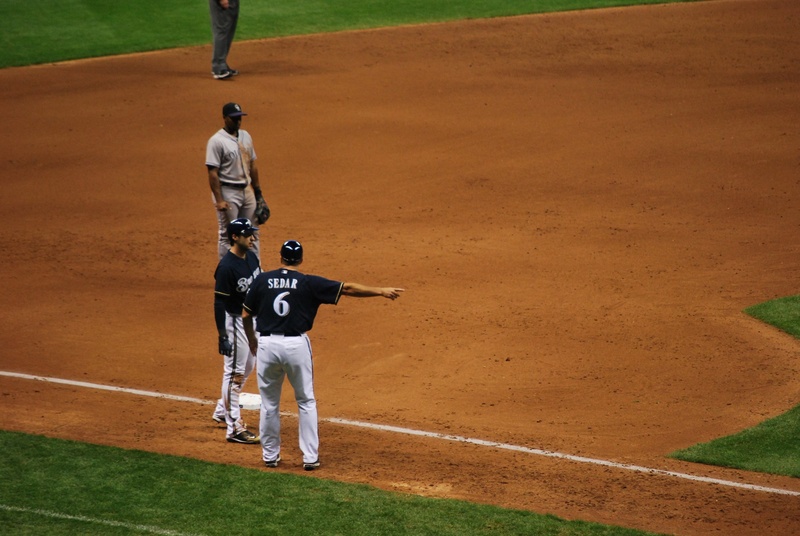 When Braun was on third at one point, Ed Sedar, the third base coach, leaned in and whispered: “Ryan, to get to home plate, you follow this white line, it’s straight ahead, you can’t miss it.” I guess I can’t say this for sure, but he was pointing, so it must be. 1) Their Jack Russell Terrier, Balkee George, who would play tug-of-war with a rag bone all day if you were up for it. Within five minutes us of getting there at 10:30 pm, he was sitting in front of me just waiting for me to give in. 2) Iscus, one of their three Sphynx cats. Iscus is short for meniscus, because when Jan was taking his father home (she used to breed Sphynxes), she tore her meniscus. She kept one of the offspring for herself, and the rest is history. 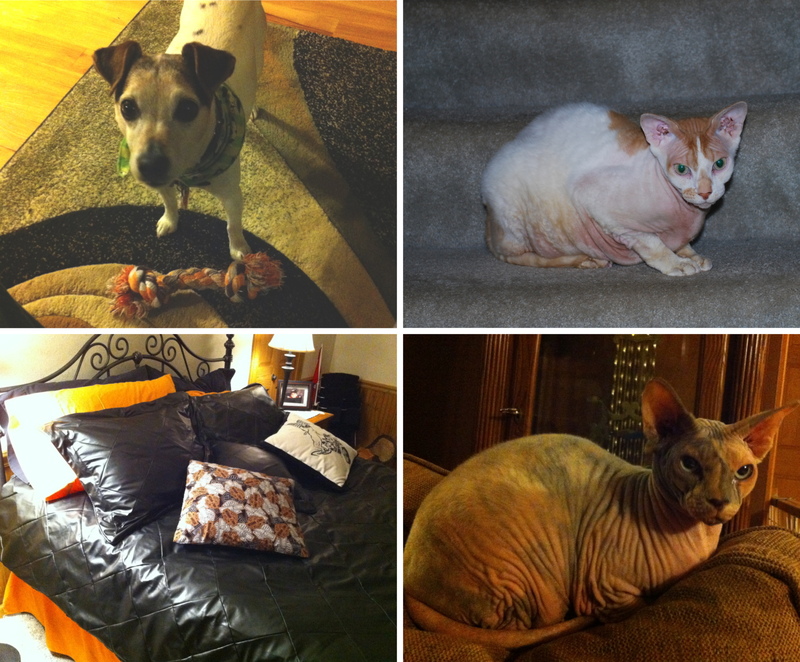 3) Princess Yoda, another Sphynx . I’ll have to admit, it was a little creepy when one of them was under the covers, with just its tail exposed. It honestly looked like there was an opossum in the bed. 4) Their Harley Davidson themed bed. The top blanket is a leather material and the sheet set is Harley orange. They have a Harley, so I guess it makes sense. The game is in three hours, so I need to get a move on.